BELGRADE, Mont. 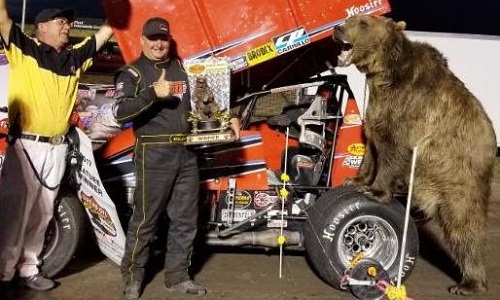 — Riding a wave of momentum into Saturday’s finale of the Grizzly Nationals at Gallatin Speedway, Wayne Johnson completed a weekend sweep with the Lucas Oil ASCS National Tour presented by the MAVTV Motorsports Network. “I can’t begin to tell you how much this team needed this weekend. 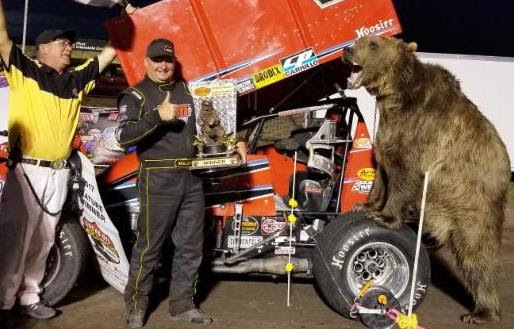 Ever since we figured out what was wrong with our car, this thing is back to working like it should,” said Johnson of his 50th career National Tour score. Starting fourth, Johnson nearly saw his night end in the first two turns as Kelly Miller shoved up the track. Able to recover and gain momentum, Johnson began picking his way toward the front as Aaron Reutzel and Giovanni Scelzi battled for the lead, with the 15-year-old taking the point on lap four. With Johnson working past Reutzel on the fifth round for second, the caution came out on lap seven for Chauncey Filler, who spun to a stop off the fourth turn. Back to green, Scelzi was in full command as the BDS Motorsports No. 1 pulled the field by a straightaway before hitting traffic at the race’s mid-point. Closing the gap to just a few car lengths, Johnson watched and waited for the chance to make a move. “Once we got into traffic, I just bided my time and watched to see what Gio was going to do. I knew he was going to be tough to pass,” said Johnson. Caught behind Trever Kirkland going into the third and fourth turn, Scelzi tried to roll the middle as Johnson shot the low side, making the battle three-wide before Johnson took the advantage on lap 17. Able to use slower traffic to keep Scelzi at bay, Johnson crossed under the checkered flag with a 0.771 second advantage. Coming up from ninth, Blake Hahn put his Griffith Truck and Equipment No. 52 on the final podium step. After leading the first three laps, Aaron Reutzel held on to finish fourth with Matt Covington making the top five. A-Feature (25 Laps): 1. 2C-Wayne Johnson ; 2. 1-Giovanni Scelzi ; 3. 52-Blake Hahn ; 4. 87-Aaron Reutzel ; 5. 95-Matt Covington ; 6. 2JR-Kelly Miller ; 7. 23-Seth Bergman ; 8. 15H-Sam Hafertepe Jr. ; 9. 99-Skylar Gee ; 10. 45X-Johnny Herrera ; 11. 75-D.J. Brink ; 12. 27DD-David Hoiness ; 13. 17W-Harli White ; 14. 38B-Bryan Brown ; 15. 0J-Jeremy McCune ; 16. 1B-Bill Boyce ; 17. 37-Trever Kirkland ; 18. 35M-Cody Masse ; 19. 24M-Rich Martin ; 20. 77M-Nate Maxwell ; 21. 74-Chauncey Filler ; 22. 77-Damon McCune.